Note: April 2018 - There are now a number of bee hives in the entrance field and the bees were showing "some interest" in cavers walking to the entrance. It may be that the hives will be moved to a more productive area for the summer months. batch 09-01 The normally draughting entrance is a short crawl off the side at the back of a dressed-stone-walled sheep enclosure. This leads to a tight bend to the right and enlarging passage to a small traverse. A 3.5m climb down at the end leads to a squeeze, crawl then stoop to a wide passage beyond. A seasonal stream enters from a walking-size inlet on the right and ends at a 1.5m high column on small gours in High Hopes. A passage passes over the top. The southern side has been scaled into a short passage, No High Hopes, to a choked chamber (batch 09-02) and the northern side is blind. On the northeast side of High Hopes, a low stoop and crawl through a loose hole enters a walking-size phreatic tube to an excavated U-tube with a longer uphill crawl on the other side (batch 09-03) that breaks out into the Left Ladders Series (batches 09-05 and 09-06). Walking-size phreatic passage heads south to a junction. To the south, large passage with some nice formations and pits eventually finishes in tall phreatic domes. (More description needed). At Easter 2013, the small continuing passage to the northeast off station 09-06.1a (at the southern extremity) was examined. It needs capping/snapping for at least 5 meters and there is very little draught. Forty metres to the NNW northwest, a small passage which heads northwest was dug out in dry sand for 2m but it needs a lot more digging. There was very little draught. The floor is sandy and easy to dig. A hammer and chisel is useful for thin calcite in the floor. It is possible to see about 2 meters into passage (20cm high and 1m wide) with a slight draught towards the excavator. It is a flat out crawl with good potential. More digging occurred in the summer, 2012, and it is now possible to see about 6m along passage 20cm high. There was a good draught. The 11m, Blood, Sweat & Tears pitch at the end of a small passage, was descended over the Matienzo November fiesta weekend and a major segment of passage explored. Batch 09-09-14 has a length of 237m. The current ends include avens and a low duck at the north west, upstream end. The weather was extremely wet during the first exploration, so neither upstream or downstream ends could be followed. The downstream end is close to the upstream as the passage turns back on itself. Downstream was inspected during a dry spell in the summer 2010. A 20cm diameter hole has a solid rock floor. Stones dropped into water beyond but it was impossible to see if the passage is large or small and whether it is worthwhile trying to enlarge the route. A short crawl to the 3rd pitch, a p6 that requires a 9m rope and 3 hangers. The tops of the first two pitches could be enlarged and the pitches were wet at Easter 2016. The final pitch drops into Mitre Passage. This heads ESE and is 2m wide and 4m high, surveyed as part of batch 16-01, 183m. Mitre Passage ends in a chamber with a mud climb to a possible continuation. There are glimpes of an accessible higher level passage in a number of places. There are also side passages to be checked and a drop at the western end of Mitre Passage. The 2017, major extensions from Mitre Passage (batch 3234-17-03) including the route to the second, SubPhone Entrance and Mulu Manners are described next. Passage description and leads by Torben Redder, Peter Fast, Louise Korsgaard. (Single station numbers are from the batch 3234-17-03 svx file, found on here.). The initial descriptions are heading towards the new, Subphone entrance, as the opening up of that entrance only occurred in the summer, 2017. Around Mitre Passage and Upper Mitre In the middle of Mitre Passage (stn 26) a 2m climb belayed through a natural eyehole leads to a passage on the NE side. The phreatic passage leads to a 20 cm sandy dig (stn 39), which will require capping. On the SW side a 2 m climb (also belayed on a natural eyehole , leads to a ledge heading NW above Mitre Passage. This higher passage is called Upper Mitre. The first 6 m traverse of Upper Mitre can be secured by a traverse line (one bolt in each end). Upper Mitre passage has several holes leading down to Mitre Passage, which fits with the avens marked in Mitre Passage. At the end of Upper Mitre passage there is a possible climb up (S of stn 48). Just after the traverse in Upper Mitre passage two passages head off south (stn 42). The first passage (stn 50) is a crawl that leads back to near the top of the ramp just SW of stn 26. It is seen from there that this ramp does not continue up further. The other passage is a walking size rift, that turns towards SE. At stn 59 a draughting crawl leads NE for about 6m to a 4m climb up that was explored in February 2018. A small stream comes down the climb. Three bolts were used to gain a space under a bedding roof where soil has been washed out. A climb over the top leads to a p7 which was not dropped, but visual connection made from below. No other ways on were found at the top. Further on at stn 60, another crawl leads NE - this was not pushed. Further on, a flat out crawl under bedding leads to a 4m Ø chamber (stn 64), called Boulder Junction, with multiple ways on. Boulder Junction Boulder Junction (stn 64) has a boulder choke roof. There are two parallel shafts (p10) leading to the same place. The p10 leads to about 20 m of horizontal passage (a 10m inlet and a 10m outlet). Where they join, it is possible to climb up to a rift, but all ways on get too small (the bottom part was not surveyed due to PDA malfunction). Climbing down towards the north in Boulder Junction leads as the first step back to an alcove overlooking the chamber (stn 28) at the SE end of Mitre Passage. Just as that level is entered there is a p13 down to Hidden Crawl (batch 18-05) and just to the N of that a 1.5m climb down a rift into the chamber (stn 28) at the SE end of Mitre Passage. Climbing up in Boulder Junction towards the south, just over the P10 shaft (sling put across the shaft, to make the return more safe) and through a boulder slot leads to a rocky ramp. Stay to the right to avoid de-stabilizing the ramp. The ramp up leads to Ali Chamber, a 50x10m and 6m high chamber with multiple ways on. Sandy Chamber has 3 ways on: towards the east, a c4 up boulders back in Ali Chamber; towards the southwest, a climb up into a sandy passage, about 20m (surveyed as batch 18-01b, no way on found); the Rocky Floor passage (stn 87) leads to a squeeze, that was dug out for comfort. Just before the squeeze to the left, a 3m long passage (stn 92) leads to a possible way on towards the east (may have a loose roof) and a climb up in a tube/rift towards the west. Past the squeeze, the floor is sandy with mud tiles. In Side Road, on the way to Under Road Chamber (stn 97) there are two avens/tubes up which need bolting. Under Road Chamber was sub-phone-located to just under the road, and the surface team hammering on the road was very loud. Northwest from Under Road Chamber, a small draughting hole up is reached (stn 106), Ø about 30 cm, and 2m high. Stn 106 was also sub-phone-located, and digging started from the surface (site 4536). This was opened up as the SubPhone Entrance in the summer 2017. Around Under Road Chamber there are many small passages that interlink. A crawl leads off from stn 120 to a draughting dig (mud). Passage can be seen across the top of the dig after 2 m. This must be close to the surface. We started the digging, but needed a digging tool. Twenty-five metres south of Under Road Chamber is Gypsum Chamber. The small passages towards the southwest lead to places with roots. At stn 134 there is draught. At stn 136 there seems not to be draught. Leads off Ali Chamber At the southeast side, in the southern part in Ali Chamber (stn 75), a rift down remains blocked after we tried to remove a 200 kg boulder. If the upper corner is snapped off the boulder, it will slide down. It is possible to crawl in the top of the rift, but then rope is needed to get 6m down to a floor. This was explored at the end of January 2018 but found to be blind with dripping water in the end coming from a stal section hidden in the wall in Ali Chamber. At the northwest side, in the southern part in Ali Chamber, there is a drop over boulders into Sandy Chamber. At the southeast side in the northern part (stn 77), there is a combined shaft/aven (The Shark). The shaft drops to the known chamber below. From two studs descend about 6m down to a ledge at a big column. Do not walk on the floor to the north of the ledge, as it looks dangerous when seen from below (false floor!). About 8m southeast from where the ledge is reached, the ledge get close to the mud slope below. Two studs have been placed, as this will be the easiest access to the ledge (c5 on rope) from Mitre Passage, until the new entrance around Under Road Chamber has been established (it has been - site 4536), and access is via Ali Chamber and The Shark. Just opposite The Shark, a bolt climb (3 bolts, explored February 2018) leads to the start of a passage, but it is filled with sand to the roof. Way on past The Shark Possible ways on towards the southwest on the ledge. Continue flat out under the bedding (stn 146) towards southeast, and up between boulders. From there (stn 149) there are 4 ways on. The impressive Mulu Manners, an 8m wide and about 6m high passage, continues for about 170m towards the southeast. Towards the south there is a way around (stn 148) the fallen roof back into Mulu Manners. Further towards the south leads to a grotto (stn 176) and a way under bedding (stn 190) which has not been pushed. Just to the northwest (stn 179) there is a draughting crawl that, in the beginning, is very well decorated with stal. In places it is flat out crawling. At the current end (stn 189) rock flakes are moved to the sides to make access easier. At the end of January 2018, the flat-out crawl was pushed for 15m to a point where it is only 20x60cm wide, but there is good draught. That point was measured to be 8m after stn 189. The passage crosses over the north end of Ali Chamber. Mulu Manners About 20m into Mulu Manners (stn 151) there is a sandy crawl/dig to the south. About 100m down Mulu Manners, an 8m handline on natural is needed down a slope. Just past the slope and up, the passage splits for about 30 meters (stn 154-155). The passage towards the north has a beautiful anastomoses roof. At the end of Mulu Manners the passage goes up and splits at Mulu Junction. North and south off Mulu Junction Just north of Mulu Junction, under a gypsum-coated roof, there is a loose slope down which was explored in the summer 2017, and is the route to the South Passage (see below). Crawling further E over rubble leads to two chambers. The southern chamber has a c4? aven in the southern end that needs bolts. Just to the right of the c4 aven, a climb up through a slot leads to the area S of Mulu Junction. Back in the 10m Ø chamber, to the north it is possible to climb down between boulders but there is no way on. To the east, there is first a passage heading south to a p25 (stn 163), which could bring the cave down to the lower Riaño Cave level. In January/February 2018, 3 bolts were placed before the drill battery failed. A later trip found the drop impassable due to the amount of water cascading down. (This is likely to be due to water sinking in the wet weather in the valley directly above.) In April 2018, the pitch was dropped and chokes on a sandy floor. A window on the SE is more roomy. An unexplored traverse can lead into a rift on the NW wall. Finally, there is a passage heading east into a rift where water runs down. This may continue up where the water comes from. From Mulu Junction to South Passage Up to the left at Mulu Junction, a hole in the floor is the top of a loose scree slope - a 6m slide down with a 12m handline replaced January 2018. (Batch 17-04). A walking size sandy-floored passage leads off. The route meanders with occasional large boulders and slopes to negotiate. Down to the left there is a 15m pitch which has been dropped in a phreatic tube to a muddy floor and no way on. A slope up enters Chamber of Good Manners. There are crawls in the north end and a rift up in the south end becomes too tight. This crawl goes towards the north. However it seems like the "aven" in the southern end can be bridged into with a couple of bolts as protection. A hole in the east wall is the way on and where batch 3234-17-05 (600m) starts - ending to the north at the Ski Slope and, to the south, South Passage. A roped c2 is the entry to the draughting tube on the east side. A batman rope up loose gravel and down on the other side leads to easy and big horisontal passage with no need for SRT to progress the absolutely dry passages all the way to South Passage. Above the Batman down slope, a roof tube (Ø 1m) has been climbed for 6m (2 bolts) to a horizontal level that went for 3m until filled with diggable size rock/flakes. It was possible to see 3m further, but the space was only 10 cm high. In the first large chamber after Batman, the climb down leads to a flat sandy/rock floor under bedding with no way on. The passage/rift heading N could do with a belay bolt, so has not been pushed. There are very few formations. On the way towards The Ski Slope there are canyons with sand and boulder strewn floor and a big chamber with possible ways on to the north and down, eg batch 18-07 slopes down from station 17-05.27 and leads to 28m of horizontal passage. The Ski Slope leads to some passages that all seem to end in the same boulder choke, where it is wet. The top of this boulder choke is at a similar altitude to the passage choke in the high level passage, Dingle's Delight in Cueva de Riaño, and 33m further to the NNE. This choke at the top of the Monster Ramp may be pushed over the top via the draughting aven at stn 17-05.47 (about an 8m climb). There is also a passage on a cracked mud floor that gets too small. Batch 18-08 description to go here. At the start of South Passage you have to balance on a ridge of break down. At stn 17-05.64 exploration was left in the summer 2017 with more ways on. Exploration down South Passage continued in January / February 2018. The left hand route continues low (flat out) for about 10m, then opens up into a 15m high rift/chamber (B Chamber). There are multiple small ways on from the chamber and it is quite complex. Climbing a C+2 on the northwest side leads to a way in behind the wall, where it is possible to get up left to a point looking down into B Chamber. A rift heads south and splits. Towards the SE it gets too narrow. Towards the NW (New Hope) there is, at stn 18-02.10 a passage with drop down into the top of B Chamber (voice and visual connection). Further up there is an aven from where water continues down the p20? below. There are loose boulders around the rim of the shaft. Don’t Stop Now. This is back in South Passage where a ramp up behind large boulders leads to a steep sandy ramp down into a space under bedding. There seems to be two ways on (not surveyed yet): one with a p8 and another possible lead straight ahead, from where it is possible to see into the p8 through a rift. Napoleon Passage. (Surveyed as batch 18-09; length 170m) A c+4 leads to horizontal passage. A rope has been left as a hand line. About 10m into the passage, beyond the climb, there are strongly draughting - but too small - holes in the south wall. The 4m high canyon can be followed in the top, changing to walking size and then crawling before it pops out into a 3m wide passage, Battleship Down! Towards the E it chokes; a passage rising to the south then west also chokes. To the west is a 12m pitch which has no draught but may continue in a rift down. Above the p12, a 4-bolt traverseon the N wall leads to a 3m diameter chamber with a lot of helictites but no way on. The roof is choked with boulders. B Drop. A well decorated, 4m high and 2-3m wide route sets off from the summer end of South Passage and leads to a pitch with a p8. The bottom of p8 is B Chamber, so the p8 was not dropped. (Surveyed as batch 18-02, 168m). Crystal Mine. As above, climbing up the c2 in the NW corner of the wall in B Chamber and spiraling up left behind the wall leads to the view point above B Chamber (stn 1.5). This is followed by a climb (protected by 1 bolt and stal) up in the N corner. From there a walking size meandering passage is heads west for about 100m. The passage is very nicely decorated with stal and helictites. At the end the passage gets too small. In August 2018, 3 dig queries around B Chamber were excavated and found to join to known passage. Batch 3234-17-06 A short body sized tube leaves the main passage east, roughly 25m south of the junction at station 17-05.27. A large fallen white flake of calcite marks the entrance to the side passage. At the bottom of the tube, a T-junction is reached and the passage is stooping height. To the right the passage closes down almost immediately with no prospects. To the left the passage enters a small low circular chamber up a steep ramp. From here two routes converge on another chamber surrounded by fallen boulders. The main route continues round the circular chamber and down a steep slope. A second route is through a tight crawl, partly blocked by a boulder. From this second chamber, the roof height enlarges significantly. A low route east under a huge fallen boulder could be seen but was not pushed or surveyed. Straight on up a slope in a gap between fallen boulders leads to a junction (17-06.9 - marked by a small cairn). From this junction heading north leads up a steep slope and a 1m high step into the big chamber at 17-05.29. Heading east is in a short wide passage with many fallen rock flakes towards a rift heading roughly north/south (stn 13). In a hole in the floor below stn 13, a big chamber can be seen below. The chamber was briefly entered beyond stn 14 in the summer but not pushed or surveyed due to time constraints. The documentation of WWNTF happened in February 2018. We Were Not The First (WWNTF) The series can be entered from the south via the east/west passage. Another route is from stn17-06.14: the p2 drop leads to a shelf, from where there is a 4m drop into the chamber below. Getting across the p2 drop into a tube leads to a junction where there are 3 ways on, one down towards the north (a dig in sand/rock, 40x10 cm), one up towards the north (draughting, solid rock 20 x 80 cm, may get wider around corner) and the last down towards the south, from where the WWNTF Chamber is entered. 1) A low sandy crawl that draughts but get too low. At that point the passage has a flat roof and sandy floor with sand slopes up to the sides - easy digging. 2) A climb up towards the east leads to a ledge, from where a rift is entered and also “continues low under boulder” is reached. At the ledge there is also a c2 up back in the chamber above WWNTF Chamber. The rift heads south and ends at a 20 cm wide rift that draughts. Batch 3234-17-07 From the main passage at 17-05.22, a low passage leads off roughly east and shortly enters a chamber with many fallen rock flakes. To the south, a low crawl under a boulder leads into a stooping-height chamber at stn 3 (cairn) and eventually into a walking height passage. The passage ends in a huge boulder choke underneath the main passage between stations 17-05.50 & 51. A very low crawl was evident heading west from the stooping height chamber but not investigated fully. Heading instead along the long-axis of the chamber at stn 3, a low crawl in the roof drops down into another small chamber, where a voice connection was heard from a hole in boulders below the main passage junction at 17-05. 27. A small passage from this chamber emerges into the main passage just south of the station 27 junction. South-ish Passage (batch 3234-17-08) in entered down between boulders at the start of South Passage. Batch 09-09-14 was extended to the south (summer 2010) in a set of passages and loops, surveyed as batch 10-07. It is very difficult to see where the passage is going in this area: it seems to be an old, re-excavated passage so, where you move out of the area of water ingress, it's choked up. However, there is one open lead left. This may have been looked at over Easter 2013 when 2 trips were made into this area to push and survey (batch 13-01). The first extension goes off from station 3234-10-07.3234_10aug20104.3 in the lower passage and, decorated with some 1m straws, goes west for 15m until it is below a previously known chamber. Water drips into the passage from the chamber above. Removing boulders revealed a route into the chamber but the connection was not made due to possibly unstable boulders. First: A crawl to the left to a chamber (Bird Wing Chamber) with a p8 and p7 (likely leading to the same passage). The p8 gets really close to a dig (see 3rd target) below). 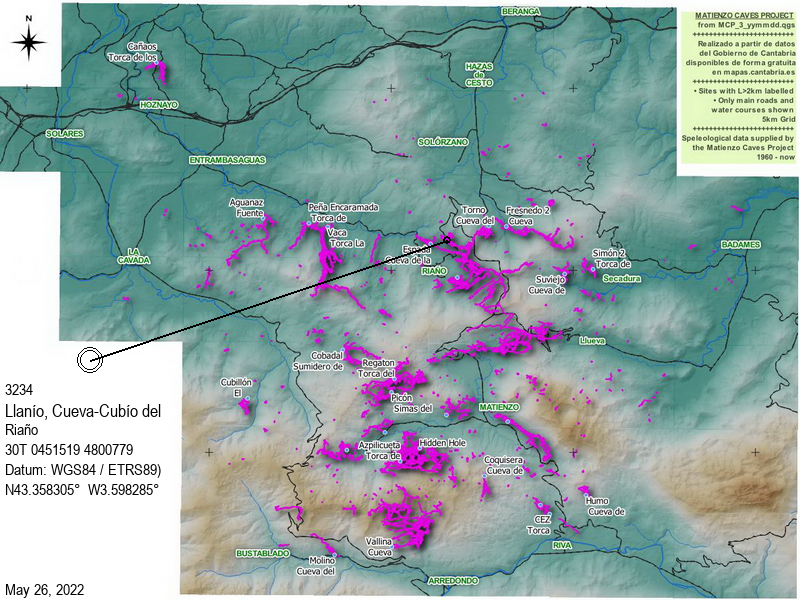 At Easter 2014, the following explorations were made but not surveyed due to a DistoX malfunction. The letters refer to the notes made in the logbook and on the survey in the Bird Wing area. 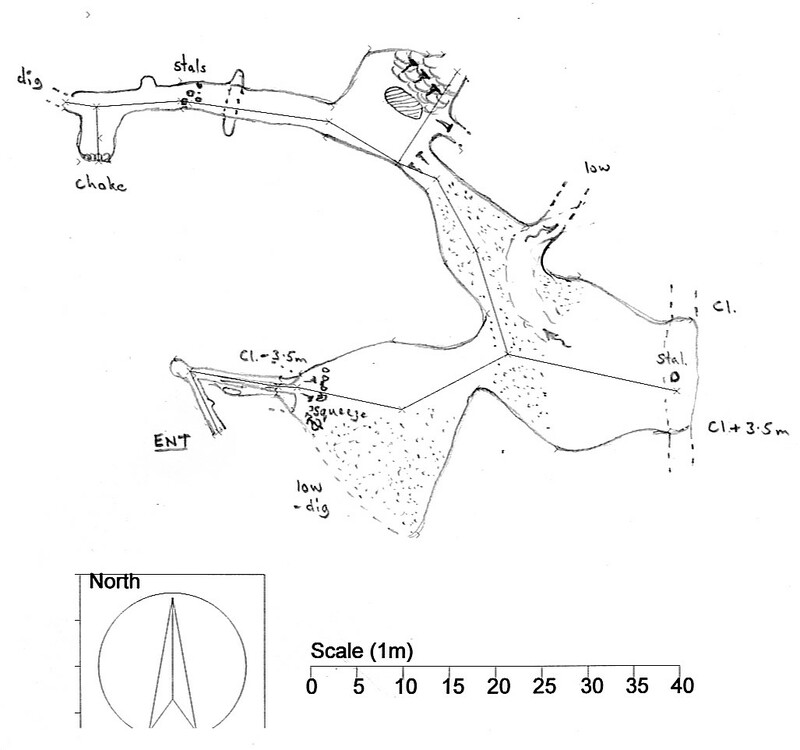 C: The p8 at the S end of Bird Wing Chamber was dropped into NE descending passage that goes under the p7 and drops about 15m from the top of the p8, moving about 15m towards the NE. There is no way on in the NE direction. At the base of the p8 there is a 20x30cm hole which draughts and an 8m drop to a possible passage. Needs caps or snappers. Leads to Mitre Passage, see above. D: The p14 was dropped to a false floor to a mouse-hole where water disappears. E: The end of the rift needs snappers for a few metres. F: Crawl for 5m, digging. One or two snappers will reach a chamber / passage of about 4m diameter dropping down. Hole below p8 in "C" and "F" are very close and are expected to connect. Second: Crawl straight to a 4m high meander, where the far end might dig to a continuation. Where the meander is entered, there is a small squeeze down in the floor,where water runs down. The squeeze ends too small with no way on. The third objective was a dig at top of the ramp just N of the bottom of the p16. A 4m crawl leads to a too narrow window into a bigger passage, with a draught. The window may dig, but most likely it leads to the same passage as the p8 mentioned above, as the horizontal distance is only about 3m from disto measurement down and towards the W in p8. There may be a higher passage to the right at the T junction (3234-09-14.blood-and-t-pitch3.0), just 30m WNW of bottom of p16. This needs a rope and 1-2 bolts to protect. The high and low level digs were looked at over Easter 2016. The former closed in after a very muddy dig and the latter, constricted dig, has yet to be excavated. The upstream end was pushed to more than 750m of passages (not all directly linked to the Blood, Sweat and Tears area) over the Easter 2010 period. Batch 10-05 is a consolidation of batches 10-01, 10-02 and 10-3. The inlet was pushed in dry conditions over gour pools and after two days connected to the Pulse Racer. Here, a big side passage at the eastern end was entered up a 2m climb. The passage loops back to the Pulse Racer but also closes in as it almost reaches the surface. At the western end of the Pulse Racer, a traverse across the p4 (3 bolts) enters a passage that lowers to a flatout crawl and squeeze into a 7x7m chamber. This contains a boulder choke at the northern side that could dig. At the southeastern side of the chamber, High Pulse Passage leads to a sand choke where the air feels fresh. Six metres into High Pulse there is a good draught from a rock and sand dig to the south. Just before the Horny Dog series is entered, there is a good sandy dig on the east. This was excavated (summer 2010) for about 5m but a team of 3 and and a drag tray are required for further progress. Horny Dog ends in a chamber with two ways out - a rift in the floor and a p10. The p10 leads into a big chamber that runs below the eastern end of Horny Dog and below the rift in the floor. The p10 requires 2 + 1 bolts. The edge is bad quality mud and rock that makes the edge quite unstable. The rebelay to the south keeps the explorer out from the unstable wall. The main passage continues about 80m to the west, in places almost filled to the roof with very nice mud layers. A few metres to the east of the p10, a rift was dropped (Easter 2015) into a 4m long meander towards the east. This was choked with mud. At Easter 2014, the duck was lowered. This is "60m east" of the High Hopes - Horny Dog connecting crawl. Following the water back down from High Hopes (batch 09-01) leads past a cracked mud floor to the left and a hands-and-knees crawl over mud with the water disappearing to the right. This draughting dig was excavated at Easter 2014 and connected through to the Horny Dog series. Straight ahead enters a chamber, Whoopee Hall, with a walking route straight on. 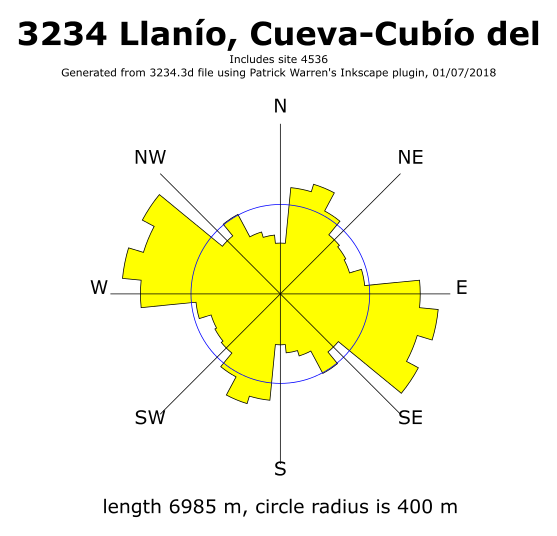 This lowers after 15m to a decorated crawl which splits. Left and right routes choke very near the surface. At the base of The Hub is a hole which leads to a little chamber with a sand / mud floor that comes very close to the passage below (Horny Dog level) which ends in a sandy choke. The two passages could probably be connected by digging (bring a shovel!). This small chamber was revisited in the summer 2015. At the top of The Hub slope, the walking-size passage sets off to the right over small collapse, with massive limestone forming the lower parts of the walls and more lumpy rock the upper walls and roof. On the right, small routes lead back at high level to the northeast wall of The Hub. The route continues down to the left past cave pearls on the floor and then left again to head west. The passage swings back on itself and walking / stooping over collapse through Wide Open passes the northern limit of Easter 2009 exploration and, after another 25m, breaks out into a nice phreatic passage. The passage slopes down past a groups of stal, passes a mud floor and enlarges at an aven. (batch 10-06) To the east of the aven a rift drops to a dig with a larger section beyond. This was pushed through a sand choke in the summer 2010 to a low crawl for 25m, winding left and right. This breaks out into a large chamber then over a rock step dropping into another chamber and ending in an 8.6m shaft which chokes with a trickle soaking away. The Aven has been Disto'd to give a height of 32m. This was partially bolted (about 14m up) in the summer, 2010 and completed in the autumn, 2011. (There is one rebelay, 3m below the top of the climb, with a rubpoint, currently protected by tacklebag. The next team can finish the 8mm hole about 0.5m left of the rebelay to get a rebelay without the rubpoint.) Near the top, a traverse of about 7 bolts is over loose material. Everything moved on the traverse will go down the shaft, which makes it a bit dangerous. The aven climb and the new Aven Series was pushed fror 424m over 4 days. After the traverse, a climb up through a slot enters the Highway with broken down rock on the floor. The draught blows towards you on a hot day. This leads to The Cross Roads Shaft. The rock of the walls is very bad for bolts, but the roof corners are good. Four bolts are put in row over about 6 meters in the NE side of the wall, with the last bolt just behind blocks as the slope starts. One more bolt just over the edge provides a 20m free hang. Starting about 4m off the floor on the pitch, the East Wing is reached by the "Line of Fire" (a traverse of 6 bolts) and a 3m climb (1 bolt) to an anchor in the passage (2 bolts). A good draught blows towards you. A boulder choke at the end is very solid at the top and seems close to site 3454, Cueva-Cubio del Llanío 2. It may be possible to climb down into the choke, but it seems not really safe. There are 2 pitches near the end of the East Wing. The pitch on the south side of East Wing (8m southeast of the grotto) was descended and passages explored around January/February 2012 (batch 12-01). The shaft is called Eels Shaft and is split p13 + p5. The anchor is 2 studs on the wall with the rope up over a boulder into the shaft, and one stud to free hang the p13. This drop ends 2m below a 1m chock stone and there is one stud for the next p5 slope. At bottom of the p13 a crawl south through Eels Grotto leads into walking size passage past Eels Mouth and into side of the 6m wide Eels Aven (22m up and 8m down). There are 8 studs put on a traverse into the passage across the aven. However, there is only 2m of passage before the route drops 4m into a meander/aven (22m up) with no way on. In Eels Aven there could be a passage 6m above middle of traverse, but this may end as an aven. Back in Eels Shaft, the p5 (after the p13) leads to the bottom where a smaller meander stream comes in from the south (not pushed). There is possible passage on the wall above the meander. Towards the north, the meander continues towards a 4m wide chamber just below the (undescended) p15 on the north side of East Wing. From the chamber, a 2m climb up leads into walking size passage with a muddy floor, heading north. This ends in a mud choke. There may be higher levels (which need bolting) or it may only be a meandering roof. The small meander stream continues past the chamber towards the north and has not been pushed. North of the Cross Roads Shaft, a 3m climb down (rope recommended) and and a p6 leads to a 6m diameter chamber with several ways on, sometimes a bit muddy. There are a lot of unpushed passages. Northwest of the Cross Roads Shaft, climbs may lead into tubes and horizontal passage. One of these is the West Wing, explored at the end of January 2012 as batch 12-02. West Wing is entered by descending about 10m in Cross Roads Shaft and doing a pendulum, followed by climbing a 2m gravel wall. A nice sandy floor is similar to East Wing. After about 15m it turns north and after 5m enters a boulder choke/rift. A narrow rift heads back into Cross Roads Shaft. Climbing up the choke/rift leads to walking size passage on a boulder floor heading west for 12m and ending. At the top of the choke the passage leads back into Cross Roads Shaft. Back at the base of The Aven, the passage slopes down over mud to a pit in the floor and a level area just before station 16 on a large rock. This is another hub and routes and passages are more numerous from here on. (Batches 09-1311 & 09-131) The pit is a 3m ladder climb through a mud-lined slot to the head of an 15m free-hanging drop in a large rift. This is probably best dropped using SRT as there is a possible passage to swing or traverse into 5 or 6 metres up from the bottom. The drop ends on a ledge with a climb over a lip to a drop of at least 15m which is undescended. (The probable base of this would be at the same altitude as Terminal Decline.) A short climb down from the ledge ends below a possible climb up into the visible passage to the west. "Muddy, awkward top opens out with an easy descent to a bridge between drops. A short climb down then up enters a short section of passage which chokes." (Included in batch 10-09). "From the top of the bridge, pitch descends to an awkward mud hole (easy dig) to a further drop and a short horizontal section to a further drop of c5m. Needs bolts before and after mud hole." 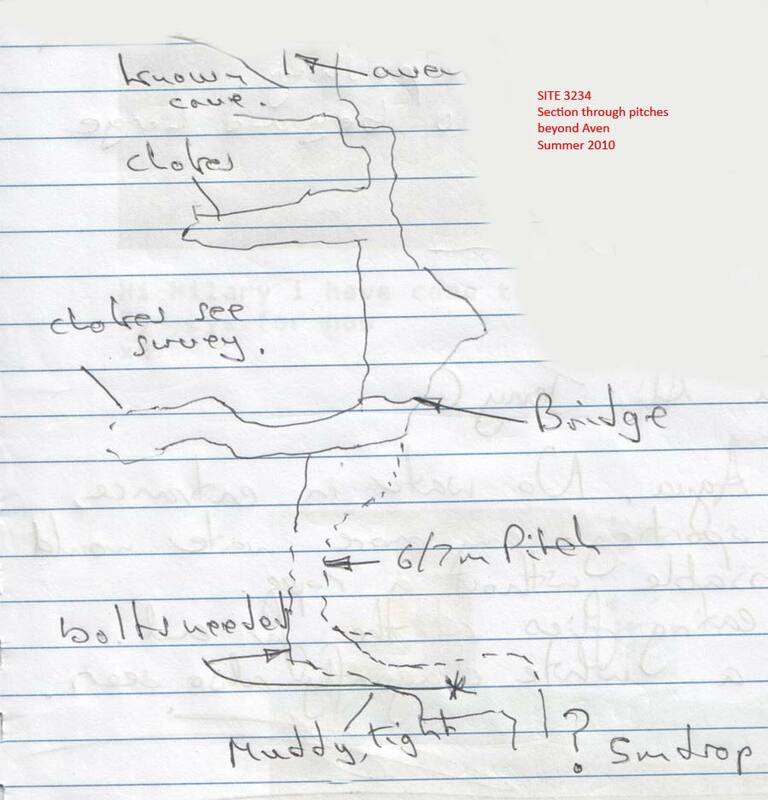 A section sketch of the pitches (from the 2010 summer logbook) can be seen here. (Batch 09-091) The large passage to the north of the pit contains 3 rifts which can be skirted around or climbed into. At the base of the middle one, a dig to the east has gone 20+m to another dig and a passage that becomes too small, while the further rift links to known passage to the west. Beyond the rifts, the passage swings to the left (with a possible climb up on the left wall) and rises on sand to an apparent dead end. However, a narrow climb up on the left and squeeze through closes the Jovens' Loop - larger people enter the rest of the loop at station 16. Where the passage swings to the left, a climb up in a boulder-floored rift enters the Lazo de Ancianos, surveyed as batch 2889_11_01. A small passage passes through a couple of squeezes and a short crawl in a tube before reaching a small T-junction. To the right (northwest) the passage closes down. To the left, a 5m flat out crawl has been dug and pushed by one person to a short section of (unsurveyed) walking passage that closes down at a small hole as it apparently approaches the Joven's Loop. The sandy dig at the "apparent dead end" was excavated at Easter 2011 and immediately connected with station 0 (1/8/09) in Joven's Loop. (Batch 09-092, batch 09-093) Turning west at station 16 leads to smaller passage. The Jovens Loop route turns right at a cracked arch feature and carries on with a climb along the right wall of a rift. Straight ahead the passage becomes too low on rubble but, to the right, a low crawl on rubble under a loose roof eventually emerges in a sandy passage which meets a cross rift with solution pockets and an immediate slope up and tight squeeze through to complete the round trip. Stepping over and around the rift after the cracked arch leads to a smaller route to Snap, Crackle and Pop (Batch 09-094), an excavated section where it is now possible to slide up the side of a large boulder into low passage, Playing Card House Pushover. The next 65m (batches 09-108 & 09-107) is stooping or hands-and-knees crawling over roof collapse, passing a hole - the entry to Yorkshire Passage - down to the left. The route enlarges at a sloping pitch head with a fine view across to the continuation of the passage swinging to the right. The 9m pitch slopes down over loose rubble with a 4.5m vertical drop to finish. (Batches 09-1110 & 09-119) The base chokes in both directions. In the summer 2010, the 6m climb at the western end was tackled but the passage at the top is now entered by a roped traverse along the southern wall requiring a harness and cowstails. A walking passage at the top leads past formations to a 15m high aven with a fine white calcite wall with a possible passage at the top. There may be possible holes down to the right. The Playing Card House Pushover Extensions continue through walking passage to a crawl and further walking passage to a lined traverse over deep drops into a more complex area. The various leads were tackled in this northwestern end over one trip in the summer 2011, including a bolt traverse to a possible "black hole". The survey has the results of these climbs and pitch explorations. Being close to Cueva de Riaño, Cueva de Entrambasaguas and Cueva Torno, this is a cave with excellent potential in most directions! Biological sampling was untaken as part of a research project at Easter 2014. Over Easter 2018, the Matienzo Karst Entomology Project (led by Tom Thompson) followed up a previous study by collecting bugs, spot sampling and setting pitfall traps in a number of sites under a Cantabria-wide permit. The Entomology Project carried out some work in this cave. 17-06 loop south of Ski Slope 8/8/2017 RB, ND, PC, DD C&C?